I met Anna, Paul Sr., Alexis, Paul Jr., and Michael about a year and a half ago, when Anna and Alexis joined my Girl Scout troop, and this sweet duo has been a blessing in my life ever since. 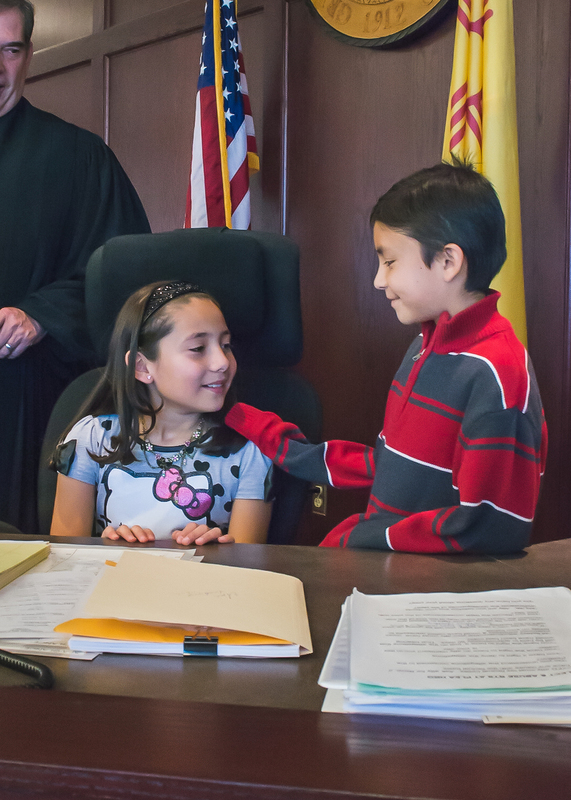 We all arrived at the Valencia County Court House on the morning of November 13th a bundle of excited nerves. We couldn't wait to get the show on the road. Soon, everyone arrived, and the Judged entered. He proceeded through the formalities, only hesitating to make sure every last detail was in order. Once he was assured of that, he asked Alexis if this adoption was what she wanted, and she happily responded, "Yes!" His Honor made it even more special by allowing Alexis and Paul Jr. to bang the gavel and pronounce it finalized. He then happily posed for a few photos with the family. We stopped for a few more photos in front of the courthouse before leaving for the Los Lunas River Park to take some formal portraits.